provides equal access to it across all sectors of the community. For more information about your RTI rights, visit the Queensland Government RTI website. For information about your access to personal information, visit our Privacy page. Before applying for information, you should check first to see if it is available online. a disclosure log — which has information previously released through RTI applications. Please contact us if you cannot find the information you are after, as we may be able to provide it to you if it’s routine administrative information. If the information you seek is not already available, you can make an RTI application for any information we hold. Under the RTI Act you can only apply to access documents. You can’t use this process to ask for general information or for answers to your questions. You can apply for documents by submitting an RTI access application online. The application fee is payable by credit card. If you are unable to use this online process, please contact us to discuss alternatives. The application fee must be paid before your application can be processed. We may not be able to give you access to all the documents you request, as some documents are exempt from release. If we refuse access to the documents you’ve asked for, you may be able to seek a review of its that decision. See the Office of the Information Commissioner for details. Queensland Treasury uses a ‘secure file‐sharing system’ to allow you to securely and easily access documents released to you either under the Right to Information Act 2009 or the Information Privacy Act 2009. You will be advised in the decision letter that the released documents are available for access through the Queensland Treasury file sharing system. 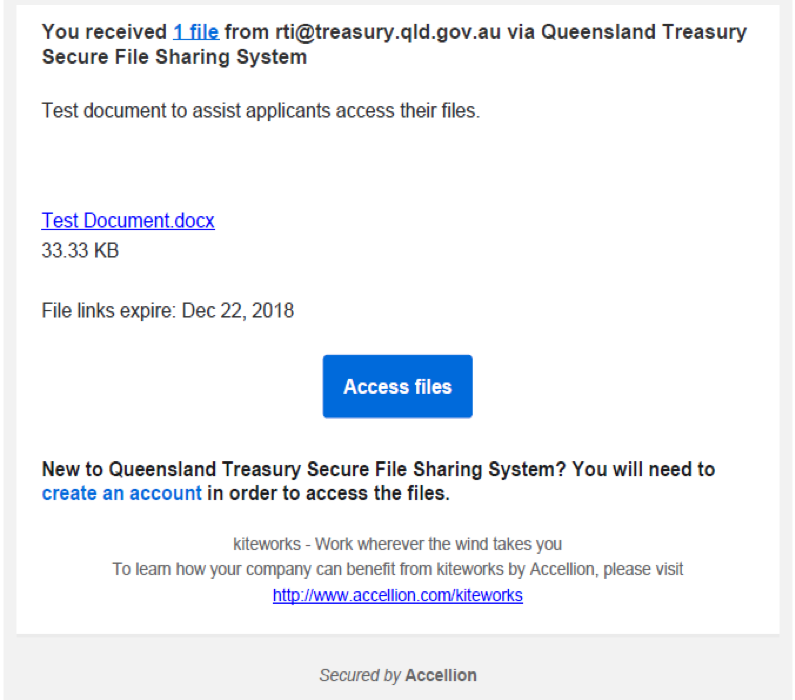 An email will then be sent to you from rti@treasury.qld.gov.au advising that the released documents are available for download and providing the link to the released documents. if you have not used the Queensland Treasury file sharing system before, you will need to create an account. to create an account, click on the ‘create an account’ icon in the email and another webpage will appear which will guide you through the required steps to create the account. Please note the link to the released documents provided in the email will expire after a period of time. Therefore it is suggested that you save the released documents locally so that you can refer to them as needed. Please refer the screenshot below for an example of the email that you will receive regarding access to the released documents. 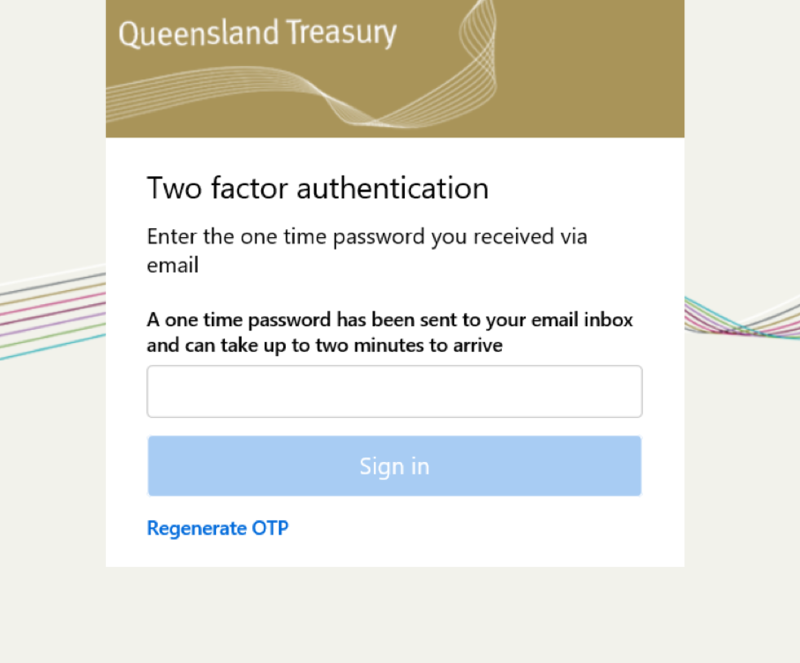 The Queensland Treasury file sharing system uses a two factor authentication for completing the creation of your account. Once you have followed the prompts to create an account and you have signed in, a one time password (a 6 digit number) will be sent to your email or mobile phone. Once you have entered the one time password, the released documents will be available for you to download. The screenshot below provides an example of what the two factor authentication password process will look like. All RTI applications have an initial fee. This fee cannot be waived. access to documents (no access charges are payable if documents are provided electronically). Please visit our Privacy page to find out how you can access your personal information or amend documents containing your personal information.